Alcohol use is ranked as risk factor number one for ill health and premature deaths in parts of Southern Sahara and Latin America. View the booklet "Alcohol and Development"
View the booklet "Prevention works"
Alcohol use is related to a broad range of health problems, as well as social problems. This is a fact in cultures and countries all over the world. Even if the general level of alcohol consumed is lower in developing societies than in Western countries, alcohol still represents a serious obstacle to development in many countries in the global South. These facts are described and discussed in the FORUT booklet “Alcohol and Development”, printed in October 2014. You can download the publication as a pdf file here. The Global Burden of Disease study has ranked alcohol use as the fifth largest risk factor for ill health and premature deaths globally. In parts of Sub-Saharan Africa and Latin America alcohol is health risk factor number one. Even more alarming is it that alcohol consumption is likely to increase in developing countries in the years to come, followed by an increase in alcohol-related harm, - if alcohol policy and alcohol prevention is not on the development agenda, for governments and civil society alike. The booklet “Alcohol and Development” describes how alcohol use is an additional stone to the burden in developing countries; health problems for the drinkers, alcohol as a risk factor for HIV/AIDS, poverty, genet-based violence, road traffic accidents etc. Furthermore, it explains how alcohol problems can be defined and understood and also how they can be prevented by concerted policies and good prevention programmes. Here is another FORUT publication which takes the issue one step further: "Prevention Works; A toolkit for addressing alcohol and drug problems in a development context." 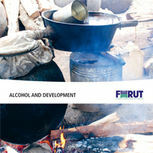 This booklet describes how development NGOs can address alcohol problems in their project areas, by advocating for better policies, by educations programmes and by mobilizing civil society.